Located on the outskirts of the ancient market town of Forres in Speyside is Scotland’s best kept secret. From a small and almost lost distillery emerged a single malt with distinctive qualities reflecting its exclusive hand made credentials as well as encapsulating the self-reliance, sophistication and modern values of Scotland today. Established in 1898, the distillery experienced many closures and changes in ownership prior to 1993, when malt whisky specialists, Gordon & MacPhail rescued it. After being extensively re-equipped, Benromach was officially opened by HRH The Prince of Wales in 1998. At Benromach we passionately craft high quality single malt whisky with minimal impact on the environment. Golden in colour, with a unique warm mellow character – the secret of Benromach is too good to be kept. Stylish and sophisticated, Benromach is a drink to share special moments with special people. Those wishing to discover the secret of Benromach should start their journey with the wonderful, Benromach Traditional – a rich and mellow single malt with fruit and malty tones, balanced with a hint of smoke. Benromach is a boutique distillery; every part of the process is completely hands on. 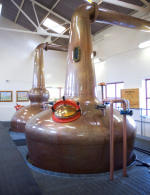 The traditional working practises and the small size of the distillery allows for innovation to be embraced. The release and success of the first bottled organic single malt whisky to be fully certified by the Soil Association plays testament to this approach. The whole process – raw ingredients, distillation, maturation and bottling – is certified organic to the rigorous standards set by the Soil Association. Golden brown in colour, Benromach Organic is a fresh, vibrant whisky with a strong oak influence. The nose reveals sweet, charred oak aromas, bursting with fresh fruit notes of bananas and pineapples. The palate exposes sweet, vanilla and toffee flavours. Benromach Origins is a series of special bottlings crafted to highlight how small changes in the art of whisky making can help shape the character of the final single malt. The first batch release in the series is produced using Golden Promise barley, grown in the heart of Speyside, resulting in a mouth watering single malt that displays sweet, creamy notes, toasted malt and very delicate peat smoke. The Benromach range is presented in bespoke 70cl bottles and striking tins, which reinforce the boutique, sophisticated and contemporary values of the Benromach brand. Benromach Speyside Single Malt Scotch Whisky is the Official Whisky of the Clipper 09-10 Round the World Yacht Race. Sir Robin Knox- Johnston is Global Brand Ambassador for Benromach. Sir Robin was the first person to sail single-handed and non stop around the world. 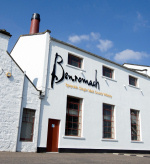 View Benromach Single Malt Whisky Range on this website.